A spiralizer is probably the easiest way to make your own veggie noodles, as they'll turn out the longest and most pasta-like. 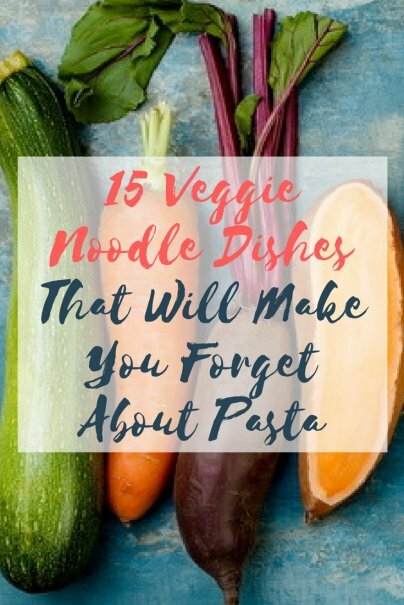 But you can also use a mandoline slicer with a shredding attachment, the grating attachment on your food processor, or buy already-shredded vegetables from the grocery store. You can also use a vegetable peeler to shred vegetables into long thin strips. With this simple vegetarian recipe for carrot noodles with peanut sauce, you don't even need to fire up the stove. Use raw spiralized carrots, or even a bag of shredded carrots, to make this simple but delicious meal. The tangy peanut sauce is surprisingly filling and satisfying. Allergic to peanuts? Just sub in almond, cashew, or sunflower butter. Spaghetti and meatballs is such a comfort dish — and you can have this zucchini version without grain-based pasta but with all the comfort! Homemade or store-bought zucchini noodles cook up in a couple of minutes, and make for a hearty meal when topped with meatballs and marinara sauce. Spaghetti squash, a more nutritious, lower-carb alternative to pasta, is served with an antioxidant-rich topping of kale, chicken, and mushrooms. This veggie-packed version is a nice change from the rich Bolognese usually served with spaghetti squash. Speaking of Bolognese, this hearty meat-free mushroom Bolognese is bursting with vegetables and flavor. And unlike most vegan Bolognese recipes, it doesn't call for tofu or soy. The meatiness comes from the mushrooms, eggplant, and veggies in the dish. Instead of pouring this over wheat pasta, use spaghetti squash or zoodles instead. You don't have to long for Chinese noodles anymore — this parsnip shrimp lo-mein noodle dish captures all the flavor and adds more nutrients than your favorite noodle dish. It comes together quickly in one pan — almost as simple as ordering in. The lightness of daikon noodles pairs perfectly with the tangy and spicy flavors of a pad thai sauce. Cooking the daikon noodles in the juices left over after cooking the chicken gives them a robust and meaty flavor. One of my favorite pasta dishes is just noodles tossed with pesto. This roasted beet version has even more flavor and is almost as easy to make, once you've made the beet noodles. Feel free to substitute jarred pesto to make this dish faster and easier. Another vegetarian-friendly, no-cook meal, this cucumber noodle dish draws from Greek flavors with olives, tomatoes, and hummus. Simply omit the feta to make this dish vegan. Enjoy a comforting hot bowl of curry noodles, but keep it light by making the noodles zoodles instead. This simple recipe for coconut curry with zucchini noodles is packed with veggies and will warm you from the inside out. For nights when you need a quick meal and spiralizing your own veggie noodles seems like a chore, that inexpensive bag of broccoli slaw you picked up at the grocery store can work like a charm as a noodle stand-in. A simple spaghetti sauce with ground beef and pasta sauce is delicious served over a bed of cooked broccoli slaw. One of my favorite ways to enjoy noodles is in a hot and comforting noodle soup. This recipe for miso soup with vegetable noodles is easy and quick to whip up, and can be turned into a heartier meal with the addition of an egg or some tofu for protein. There are few things my kids like better than mac and cheese. This sweet potato or butternut squash noodle version gives them the cheesiness they desire but sneaks in a few extra vitamins and nutrients, too. Just cut the sweet potato noodles into sections to make them look more like macaroni. I love cold Vietnamese noodle salad with veggies stirred in with a tangy sauce. This jicama noodle salad makes for an even more refreshing meal with crunchy jicama noodles subbed in for traditional rice noodles. You don't often see recipes for rutabagas, but this sweet, hearty root vegetable is delicious and satisfying, especially when used as the noodle portion of this salmon and rutabaga noodle meal. Quick-cooking and nutritious salmon as the main protein means that this meal comes together quickly.